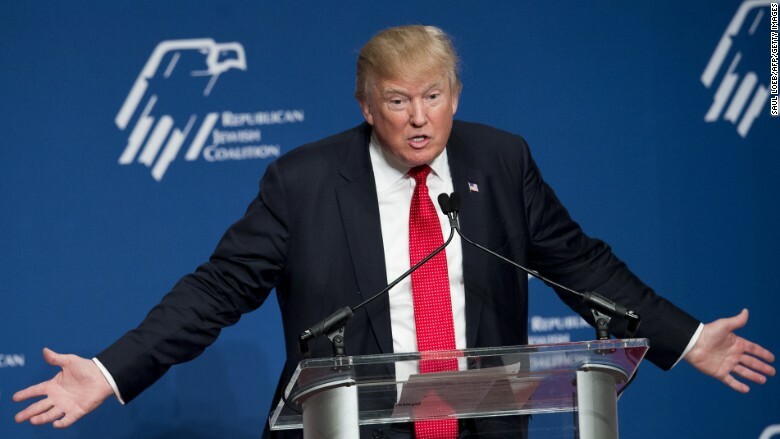 The Republican presidential candidate gave a speech this week at that party's Jewish Coalition. Donald Trump's Republican campaign for president has received more nightly news attention than all the Democratic campaigns combined, according to a new data analysis. Trump is "by far the most newsworthy storyline of Campaign 2016, accounting alone for more than a quarter of all coverage" on NBC, CBS and ABC's evening newscasts, Andrew Tyndall said. Tyndall, the publisher of The Tyndall Report, meticulously tracks nightly news content. 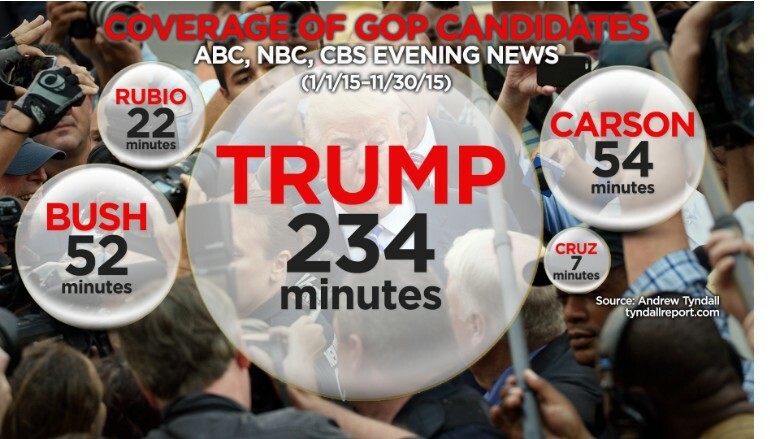 Between January and November, according to his data, Trump's campaign was covered for 234 minutes on the three newscasts. Jeb Bush's campaign was covered for 56 minutes; Ben Carson's, for 54. Incendiary comments by Trump, controversial proposals and impressive crowd sizes at his rallies are some of the reasons why he has garnered so much coverage. But the disparities in air time and attention have exposed many news outlets to criticism. While Trump was covered for 234 minutes between January and November, the GOP candidate who is now ranking #2 in some national polls, Ted Cruz, was covered for just 7 minutes, according to Tyndall. He said Cruz and the #2 candidate on the Democratic side, Bernie Sanders, have been "noticeably under-covered," with Sanders getting 10 minutes of coverage on the ABC, CBS and NBC evening news. Of course, this analysis does not count other news programs on the networks, like morning shows and Sunday morning public affairs programs. But it backs up viewers' perceptions that Trump has received much more attention than his rivals. No equivalent data exists for 24-hour cable news channels like CNN and Fox News, but Trump has also outranked other candidates there. Tyndall noted that on the evening newscasts, the 2016 campaign in 2015 has received more coverage than "any other penultimate year of the last seven presidential campaigns, except for 2007," the last time both parties had primaries. Through November, the campaign coverage has totaled 857 minutes on NBC, ABC and CBS, versus 339 minutes in the full year of 1999; 167 minutes in 2003; 1,072 minutes in 2007; and 790 minutes in 2011.